THE SECRET SINS OF THE AMERICAN EMPIRE. USA MURDERED MORE PEOPLE THAN HITLER. IRAQ is NOT THE FIRST TIME! IRAQ is 15th small country USA has invaded! CIA INVASION or PROXIE INVASION, then add Indonesia and YEMEN 17 countries genocided! Author Stephen Kinzer discusses his new book, "Overthrow: America's Century of Regime Change from Hawaii to Iraq." A former New York Times foreign correspondent and author of several books, including "All the Shah's Men" and "Bitter Fruit." In latest, he writes that the invasion of Iraq "was the culmination of a 110-year period during which Americans overthrew fourteen governments that displeased them for various ideological, political, and economic reasons." "The invasion of Iraq in 2003 was not an isolated episode. It was the culmination of a 110-year period during which Americans overthrew fourteen governments that displeased them for various ideological, political, and economic reasons." Kinzer writes that "The "regime change" in Iraq seemed for a time -- a very short time -- to have worked. It is now clear, however, that this operation has had terrible unintended consequences. So have most of the other coups, revolutions, and invasions that the United States has mounted to depose governments it feared or mistrusted." AMY GOODMAN: Stephen Kinzer joins us today in Chicago. He is a veteran New York Times foreign correspondent, author of several books, including All the Shah's Men and Bitter Fruit. He has just recently left the New York Times. We welcome you to Democracy Now! You are looking at 14 coups that the U.S. was involved with. What was the primary reason for the U.S. government's involvement in overthrowing other countries' governments? STEPHEN KINZER: A lot of these coups have been studied individually, but what I'm trying to do in my book is see them not as a series of isolated incidents, but rather as one long continuum. And by looking at them that way, I am able to tease out certain patterns that recur over and over again. They don't all fit the same pattern, but it's amazing how many of them do. You ask about the motivations, and that is one of the patterns that comes through when you look at these things all together. There’s really a three-stage motivation that I can see when I watch so many of the developments of these coups. The first thing that happens is that the regime in question starts bothering some American company. They start demanding that the company pay taxes or that it observe labor laws or environmental laws. Sometimes that company is nationalized or is somehow required to sell some of its land or its assets. So the first thing that happens is that an American or a foreign corporation is active in another country, and the government of that country starts to restrict it in some way or give it some trouble, restrict its ability to operate freely. Then, the leaders of that company come to the political leadership of the United States to complain about the regime in that country. In the political process, in the White House, the motivation morphs a little bit. The U.S. government does not intervene directly to defend the rights of a company, but they transform the motivation from an economic one into a political or geo-strategic one. They make the assumption that any regime that would bother an American company or harass an American company must be anti-American, repressive, dictatorial, and probably the tool of some foreign power or interest that wants to undermine the United States. So the motivation transforms from an economic to a political one, although the actual basis for it never changes. Then, it morphs one more time when the U.S. leaders have to explain the motivation for this operation to the American people. Then they do not use either the economic or the political motivation usually, but they portray these interventions as liberation operations, just a chance to free a poor oppressed nation from the brutality of a regime that we assume is a dictatorship, because what other kind of a regime would be bothering an American company? AMY GOODMAN: Stephen Kinzer, I want to begin where you do in the book, and that is, with Hawaii. STEPHEN KINZER: Many Americans I don't think realize that Hawaii was an independent country before it was brought into the United States. In brief, this is the story. In the early part of the 19th century, several hundred American missionaries, most of them from New England, sailed off to what were then called the Sandwich Islands to devote their lives to, as they would have put it, raising up the heathen savages and teaching them the blessings of Christian civilization. It wasn't long before many of these missionaries and their sons began to realize that there was a lot of money to be made in Hawaii. The natives had been growing sugar for a long time, but they had never refined it and had never exported it. By dispossessing the natives of most of their land, a group that came from what was then called this missionary planter elite sort of left the path of God, went onto the path of Mammon and established a series of giant sugar plantations in Hawaii, and they became very rich from exporting sugar into the United States. In the early 1890s, the U.S. passed a tariff that made it impossible for the Hawaiian sugar growers to sell their sugar in the U.S. So they were in a panic. They were about to lose their fortunes. And they asked themselves what they could do to somehow continue to sell their sugar in the U.S. They came up with a perfect answer: We’ll get into the U.S. How will we do this? Well, the leader of the Hawaiian revolutionaries, if you want to call them that, who were mostly of American origin, actually went to Washington. He met with the Secretary of the Navy. He presented his case directly to the President of the United States, Benjamin Harrison. And he received assurances that the U.S. would support a rebellion against the Hawaiian monarchy. So he went back to Hawaii and became part of a triumvirate, which essentially carried out the Hawaiian revolution. He was one part of the triumvirate. The second part was the American ambassador, who was himself an annexationist and had been instructed by the State Department to do whatever he could to aid this revolution. And the third figure was the commander of the U.S. naval vessel, which was conveniently anchored right off the shores of Honolulu. This revolution was carried out with amazing ease. The leader of the Hawaiian revolutionaries, this missionary planter elite, simply announced at a meeting one day, “We have overthrown the government of Hawaii, and we are now the new government.” And before the queen was able to respond, the U.S. ambassador had 250 Marines called to shore from the ship that was conveniently off the coast of Honolulu and announced that since there had been some instability and there seemed to be a change of government, the Marines were going to land to protect the new regime and the lives and property of all Hawaiians. So that meant that there was nothing the queen could do. The regime was immediately recognized by the United States, and with that simple process, the monarchy of Hawaii came to an end, and then ultimately Hawaii joined the U.S.
STEPHEN KINZER: The queen was a little bit shocked by all this, as were her cabinet ministers. In fact, they appealed to the United States and asked, “What instability is there? Who's in danger? Tell us, and we'll protect them.” The queen had about 600 troops at her disposal. That was the whole Hawaiian military force. And her cabinet ministers actually called the ambassadors from foreign countries in Honolulu -- there were about a dozen of them then -- and said, “What should we do? Do you think we should fight the Marines?” And the ambassadors quite prudently told her that that would be foolish. “You should just accept it and then try to regain your throne by some other means.” That never proved possible. But even then, it was clear to the ruler of this small, weak country that there was no hope in resisting U.S. military intervention. AMY GOODMAN: It still took a few years before Hawaii was ultimately annexed. STEPHEN KINZER: It's a very interesting story. Immediately after the revolution, the revolutionaries went back to Washington and, sure enough, President Harrison, as he promised, submitted to the U.S. Congress a law to bring Hawaii into the U.S., but there was a great resistance to this when it was understood how the coup was organized and on whose behalf it was organized, so the Congress did not immediately approve the annexation of Hawaii. And right at that time, the presidency changed. The Republican, Benjamin Harrison, was out of office, and the new president, a Democrat, Grover Cleveland, came in. He was against annexation. He was an anti-imperialist. He withdrew the treaty. And that meant that Hawaii had to become an independent country for a few years, until the next Republican president came into office, McKinley. And then, at the height of the Spanish-American War, when the U.S. was taking the Philippines, Hawaii was presented to the U.S. as a vital midway station between California and the Philippines. And it was at that time, five years after the revolution, that Hawaii was actually brought into the United States. AMY GOODMAN: So, first came the missionaries, then came the Marines. AMY GOODMAN: You talk about 14 countries that the U.S. intervened in: Hawaii, Cuba, the Philippines, Puerto Rico, Chile, Honduras, Iran, Guatemala, South Vietnam*, Afghanistan, Iraq, Panama. Let's talk about Cuba. COUNTRY # 2 - What happened? STEPHEN KINZER: The Cuban story is really a fascinating one, partly because it illustrates one of the main themes of my book, and that is how these interventions in the long run always produce reactions and ultimately lead to the emergence of regimes that are much more anti-American than the regimes we originally set out to overthrow. Here was the story in Cuba. Americans have had their eye on Cuba for a long time, ever since Thomas Jefferson was president. But it was in 1898 that this attachment to the cause of Cuba Libré really seized the hearts of many Americans. Bear in mind that in 1898, the Cuban economy was totally dominated by Americans. It was a big sugar producer, and all the sugar plantations in Cuba were owned by Americans. Also, it was a very big market for American manufactured goods. About 85% of anything you could buy in Cuba had been made in the United States, so American business had very big interests there. Now, Cuban patriots spent much of the late 19th century rebelling against Spanish colonial rule. In 1898 they seemed very close to succeeding. This was a little bit troubling to some of the American interests in Cuba, because the revolutionaries were also social reformers. They advocated land reform, which would have meant breaking up the big sugar plantations owned by Americans. They also supported a tariff wall around Cuba to allow the growth of domestic manufacturing, which would have made it more difficult for American companies to export their goods to Cuba. 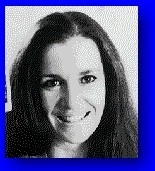 AMY GOODMAN: And what year was this? STEPHEN KINZER: These are in the late 1890s. So in 1898, the American press, in some ways excited by whisperings from American businessmen active in Cuba, began a campaign to portray Spanish colonial rule in Cuba as the most unspeakably brutal tyranny that could be imagined, and the American public was whipped up into a fervor about this. The fervor intensified when the U.S. battleship, Maine, was blown up in Havana harbor. “Our Warship Was Blown Up by an Enemy's Infernal Machine.” That was the headline in the New York Journal that I reproduce in my book. Actually, it wasn't until 75 years later that the Navy convened a board of inquiry, which turned up the fact that the Maine was actually blown up by an internal explosion. The Spanish had nothing to do with it, but we didn't know that then, and the press seized on this to intensify the anger in the U.S.
After that law was passed, the Cuban rebels agreed to accept American aid. American soldiers went to Cuba, including, famously, Teddy Roosevelt, who had his own uniform personally designed for him by Brooks Brothers in New York. In the space of essentially one day of fighting, the Spanish colonial rule was dealt its final death blow, Spain surrendered Cuba, and Cuba prepared for a huge celebration of its independence. Just before that celebration was about to be held, the Americans announced that they changed their mind, that the Teller Amendment had been passed in a moment of irrational enthusiasm and that actually Cuban independence was not a very good idea, so the American troops were not withdrawn. We remained in Cuba for some decades, ruling it directly under U.S. military officers, and then, for a period after that, through local dictators. Now, any Americans who might have read a report of that speech, I'm sure, would have been very puzzled. In the first place, they would have had no memory of what happened in 1898, but secondly, they would wonder, “What could an event 60 years ago possibly have to do with this revolution in Cuba today?” What they had failed to realize is that resentment over these interventions burns in the hearts and souls of people in foreign countries and later explodes violently. It's quite reasonable to say today that had we not intervened in Cuba and prevented Cuba from becoming independent, had we carried out our explicit promise to the Cubans in 1898, we would never have had to face the entire phenomenon of Castro communism all these last 40 years. Now, of course, we would love to have back a moderate democratic regime like the one that was going to come to power in Cuba in 1898, but it's too late for that, and it's an example of how when we frustrate people's legitimate nationalist aspirations, we wind up not only casting those countries into instability, but severely undermining our own national security. AMY GOODMAN: Now, something we see today, for example, in Iraq, is the critical role, not only of the U.S. government perhaps protecting U.S. corporations, but the role of the media in all of this. Going back to Cuba, what was the role of the media? STEPHEN KINZER: The press played a really shameful role in the run-up to the Spanish-American War. The Americans had never been particularly fond of the Spanish rule in Cuba, but it wasn't until the press, actually in a circulation war, decided to seize on the brutality, as they called it, of Spanish colonial rule in the summer of 1898 that Americans really went crazy. Now, there's one very interesting aspect of the Cuban press campaign that I think we see repeated periodically throughout American history, and that is, we never like to attack simply a regime. We like to have one individual. Americans love to have a demon, a certain person who is the symbol of all the evil and tyranny in the regime that we want to attack. We've had this with Khomeini, with Castro, with Qaddafi, various other figures over history. Now, in the case of the Spanish-American War, we first thought we'd like to demonize the king of Spain, but there was no king of Spain. There was a queen, who was actually an Austrian princess, so she wouldn't work. The regent, her son, was actually just a 12-year-old kid, so he wouldn't work, either. So then, we decided to focus on the Spanish general, who was the commander of Spanish troops in Cuba, General Weyler, and for a time, Weyler was thought of as the epitome of all the carnal brutality that we attributed to Spanish colonialism. We see this pattern again coming right up to the modern age, when we're always looking for some individual to point at. The idea behind this is that the natural state of all people in the world is to have U.S.-style democracy and to be friendly to the United States. If they're not, it must mean that there's only one person or one tiny clique that is preventing the people in this country from being the way they naturally would be, and if we could only just remove this one individual or this tiny clique, the people in that country would return to the normal state of all people, which is to wish to have the U.S. system of government and politics and economics and to embrace the United States. AMY GOODMAN: William Randolph Hearst, was he a key figure then? STEPHEN KINZER: Hearst was a crucial figure, who very cleverly realized that he could push the circulation of his newspaper dramatically higher if he hammered away on jingoistic issues by pointing at foreign nations as constantly seeking to undermine the United States. There's an undercurrent, which we're still seeing today, of seeing the world in this very Hobbesian way, that there are terrible dangers everywhere, and it's very important for the U.S. to go out and attack here and attack there before those dangers come to shore. Clausewitz, who I read a lot while I was researching my book, had a great phrase for this. He called it, “suicide for fear of death.” You are so afraid of what's happening to you in the world or what might happen to you that you go out and launch operations, which actually produce the result that you were afraid might happen if you didn't do these things. NEXT, GUATEMALA AND IRAN, OVERTHROW COUP #3 and #4. AMY GOODMAN: Let's talk about Guatemala. 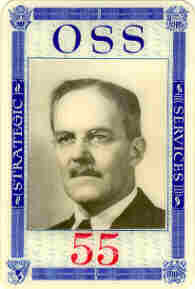 Can you talk about John Foster Dulles, who he was, his role in these interventions, Guatemala, and just before that, Iran? Dulles also came from a family of clergymen. He was a deep religious believer. His father was a preacher. His grandfather had been a missionary in India, and this gave him another strain, which is very important in the American regime-change era, and that is this sense of religious mission, this belief that since the United States has been blessed with prosperity and democracy, we have, not just the right, but perhaps even the God-given obligation to go to other countries and share the benefits of all we have with them, particularly to countries that may not even be advanced enough to realize how much they want our political system. So Dulles saw the world in a strictly black-and-white way. DULLES saw, at that time, a communist conspiracy all over the world as working relentlessly to undermine the United States. For example, he opposed all cultural exchanges with any communist country. He tried for years to keep U.S. reporters from visiting China. He was against summit meetings of all kinds. He didn't want agreement with communist countries on any subject, because he thought any agreement would be just a trick to get America to lower its guard. Now, when Iran nationalized its oil industry, when Guatemala tried to restrict the operations of United Fruit Company, Dulles did not see this as a reflection of a desire by people in a foreign country to control their own resources. He rather saw it as an anti-American move, undoubtedly manipulated from the Kremlin, which had a much more profound goal than simply bothering an American company. This was just the beginnings of an anti-American attack. I think it was for this reason. American statesmen and diplomats who study the history of diplomacy are actually studying the history of European diplomacy. We're very Eurocentric. Our diplomats and our statesmen are very well versed in European political traditions. They're familiar with alliance politics and wars of conquest and big powers that use small powers secretly for their own means, but the desire of poor people in poor countries to control their own natural resources has never been a part of European history. It's not a syndrome that Americans who study Europe are familiar with, and that, along with an instinctive desire to protect American companies, I think led them to misjudge nationalist movements and misinterpret them as part of a global conspiracy to undermine the United States. AMY GOODMAN: Or perhaps not care, but care about U.S. companies, as in Guatemala, United Fruit (America's banana suppliers!) being able to have free reign. STEPHEN KINZER: I think it was very much a sense that the companies must know what's best for the United States in those countries, but in addition, we managed to persuade ourselves that a government that was bothering American companies must also be harassing and oppressing its own people, and this is an argument that I think is very well tailored to the American soul. You know, we really are a very compassionate people, and Americans hate the idea that there are people suffering in some faraway country. American leaders who want to intervene in those countries for very ignoble reasons understand this, and they use that motive, they play on the American compassion to achieve support for their interventions. AMY GOODMAN: So talk about what fuels Iran today, the feeling Iranians have for America, based on the coup the U.S. was involved with in 1953. Now, had we not intervened in 1953 and crushed Iranian democracy, we might have had a thriving democracy in the heart of the Muslim Middle East all these 50 years. I can hardly wrap my mind around how different the Middle East might be now. This regime that's now in power in Iran would never have come to power, and the current nuclear crisis would never have emerged. This is a great example of how our intervention ultimately leads us to regimes much worse than the ones we originally set out to overthrow. Now, how do you think that people in Iran react when Americans point a finger at them and say, “You’re a tyranny over there. You’re a brutal dictatorship. You should have a democracy. You should have a free regime”? Well, they say, “We had a democracy here, until you came in and overthrew it.” Now, the United States today has some very legitimate complaints against the Iranian government, but we have to understand that Iranians also have some very legitimate complaints against us, and that should be a recognition that would lead us into negotiations with them at this point. 1. The coup in Guatemala that the United States carried out in1954 was another one of those that not only cast a whole part of the world into instability, but led to the intensification of anti-American sentiment, not only in Guatemala, but throughout Latin America and beyond. Guatemala had become independent from Spain, with the rest of Central America, in the 1820s. Like most of the rest of Central America, it had been under a series of tyrants up until 1944. There was then a revolution. And for ten years, Guatemala was a functioning democracy. In Guatemala, economic life was totally dominated by one American company: the United Fruit Company. It was a uniquely powerful company, had great ties in Washington. Many of the senior people in the Eisenhower administration were either stockholders or former board members or otherwise closely connected with United Fruit. Now, in Guatemala, not only was United Fruit producing most of that country's banana exports, but it also owned more than half a million acres of land, some of the richest land in the country, that it didn't use. It was just holding this land for some potential future use. Well, this is what set the United Fruit Company in operation in Washington. It persuaded the Eisenhower administration that the Arbenz government would not have been taking steps like this, would not have launched a land reform program, would not have tried to take land from the United Fruit Company, if it were not fundamentally anti-American. In addition, there was the overlay of the Cold War. So the United Fruit Company was able to persuade the U.S. government that not only was this government hostile to an American corporate interest in Guatemala, but it was undoubtedly a tool of the Kremlin which was, as Americans then thought, working all over the world to undermine American interests. AMY GOODMAN: And just for one minute, John Foster Dulles, 1. the Secretary of State, had represented United Fruit as a corporate lawyer. STEPHEN KINZER: Dulles was a perfect example of the tremendous influence that United Fruit had in Washington. The Secretary of State was the former attorney for the United Fruit Company. So when the United Fruit Company was aggrieved, he felt aggrieved. And as a militant anti-communist, he also assumed that this was part of a communist conspiracy. We now know from documents that have been released in Moscow that the Soviets didn't even know Arbenz and Guatemala existed, had not the slightest interest in that situation. Now, this leads to another pattern that I see in so many of these coups. The crucial moment comes right after we overthrow the government. Then we have to decide who's going to be the new guy. Who do we want to put in as the leader of this country? We want a person who fulfills two conditions: first of all, somebody who's popular, who can stay in power and is supported by his people; and secondly, someone who will do what we want. We didn't overthrow the government just to have someone we don't like in power. So, we quickly realize that you can't have both. You cannot have somebody who's popular and also somebody who will do the bidding of the United States. A popular leader will place the interests of his own country first, ahead of the interests of the United States. So, we choose the other route: we choose someone who is not popular but will do what we want. What does that mean? He has to rule with increasing repression, because people don't like him. The United States then has to support him, often militarily. That means the opposition to the dictator also becomes opposition to the United States. Resentment festers. Ultimately, there's an explosion, (as US hegemony bankrupts the country) and we wind up with a regime far more tyrannical than the one we originally intervened to overthrow. 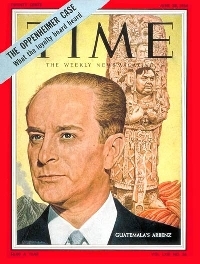 AMY GOODMAN: And the Guatemalan coup of 1954, the U.S. overthrowing the democratically elected President Arbenz, came one year after the U.S. overthrew Mossadeq in Iran. AMY GOODMAN: And with Iran, it was for British Petroleum? 1. STEPHEN KINZER: With Iran, the sin that Prime Minister Mohammed Mossadeq committed, that ultimately -- that originally set this intervention in motion was nationalizing the oil company. So, actually, these two situations were very similar. 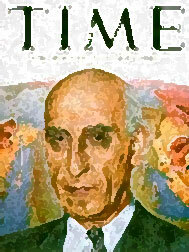 Mossadeq in Iran and Arbenz in Guatemala were nationalist leaders, not responding to any Soviet influence, who, responding to their own people's legitimate demands, decided that the wealth from their own natural resources should go to benefit their own people, rather than the Americans, the British or outside powers. AMY GOODMAN: Let's stay in Latin America, going from 1954 to 1973, to 1.another September 11th. You have a rare picture of Henry Kissinger shaking hands with the man who overthrew the democratically elected leader: Pinochet. Can you talk about what happened in Chile? STEPHEN KINZER: Chile is another one of those cases where we overthrew a leader who in many ways embraced and represented American principles, and we replaced him with a tyrant who despised everything the United States stands for. Allende was a democratically elected leader, and although he was a self-proclaimed Marxist, he had been within the Chilean democratic system all his life. He had been president of congress, and he had been a senator. He was fully integrated into the Chilean democracy and certainly would have left office at the end of his term, probably to be replaced by someone more conservative. But the United States couldn’t wait for that. It's a reflection of our impatience, our insistence that we get what we want not later, but now. In Chile, just as in Guatemala, and just as in Iran, the great natural resource was controlled by foreign corporations. In Chile that resource was copper. And the two giant American corporations operating there were Kennecott and Anaconda. 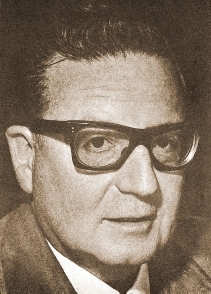 Allende moved to nationalize the Chilean holdings of those two companies. And those two companies, along with other companies like I.T.T. that were active in Chile panicked at this. They immediately went to the White House. One of the leading Chilean businessmen and the owner of the largest newspaper in Chile had a private audience with Henry Kissinger. Nixon was immediately set into motion. He became very upset about the prospect of Allende coming to power. And this is another example of how the motivation morphs. If Allende had not bothered Kennecott, Anaconda and other American companies, or threatened to bother them, they never would have protested to the White House. But once they did protest, the White House embraced their cause and transformed it a little bit. The U.S. did not intervene in Chile directly, as it would have said, to protect American companies, but the fact that a government was bothering our companies led us to believe that that government must also be strategically and politically opposed to the United States. So that then became the motivation that pushed Nixon and Kissinger, who were not real defenders privately of American business, into action for what they perceived were a combination of economic and political reasons. But that intervention was carried out in a covert way, and it wasn't until years later that the very rich documentation came out to show how completely it was a made-in-Washington operation. AMY GOODMAN: And that picture? STEPHEN KINZER: The picture of Pinochet with Kissinger is wonderful. Shortly after the coup, about a year or two later, Secretary of State Kissinger arrived in Chile to address a meeting of the Organization of American States. In that speech, he had to make some pro forma references to human rights and the American interest in promoting human rights. But the day before he made the speech, he went to visit Pinochet privately. We now have the transcript of that meeting. And he essentially told Pinochet, “I'm going have to say some things about human rights tomorrow, but that doesn't apply to you. Don't take that seriously. We support you, and we're glad that you're here.” So, the public face of the U.S. policy toward Chile even then was very different from what we were directly telling Pinochet in private. AMY GOODMAN: And speaking about Spanish-speaking countries,1. how about going back in time to Puerto Rico? STEPHEN KINZER: COUP # 5, Puerto Rico is another very interesting case, 1.because Puerto Rico was a Spanish possession. But during 1898, the new liberal regime in Spain offered Puerto Rico a tremendous amount of autonomy, which the Puerto Ricans greatly embraced. They were not rebelling against Spanish colonial rule the way the Cubans were. And they were offered an amount of autonomy that was greater than the British gave to Canada. They actually had an election. They produced a Puerto Rican domestic government, which was going to be able to have large control over the direction of Puerto Rican policy within the framework of Spanish rule. They had very visionary leader, Luis Munoz Rivera, who was to be the new prime minister of Puerto Rico. His government lasted only about a week, when the U.S. invaded on the way to Cuba, more or less. The Spanish-American War was not aimed at Puerto Rico. It was never intended to bring Puerto Rico into the U.S., but Puerto Rico was just grabbed because it happened to be there, it was available, it was lovely, it was on some sea routes that the U.S. wanted to control. So the U.S. stepped in and essentially crushed the self-governing home-rule government of Puerto Rico. It placed Puerto Rico under military rule. And very quickly, the first thing that happened in Puerto Rico over the next few years was that the small coffee farms were taken over and transformed into large sugar plantations. Coffee in Latin America is sometimes called the poor man's crop, because you can grow it on just a very small plot, but you can't grow sugar that way. So, essentially large numbers of Puerto Ricans were dispossessed to make way for four big American sugar companies, and Puerto Rico went from being a self-governing rising very confident new nation in 1898 to the status of a colony, and a greatly impoverished one, in the decades that followed. AMY GOODMAN: And so, what happened in these ensuing years, for people to understand? STEPHEN KINZER: In Puerto Rico, I think you 1.can argue that in the long run things could have gone a lot worse. This was one intervention where the U.S., after a long period of time, decided to take responsibility for developments in the country. And that was for a very particular reason. It had a lot to do with the rise of Fidel Castro in Cuba. Suddenly, the idea of the U.S. having a miserably poor colony in the Caribbean didn't look so good. It was a bad contrast to Cuba. So it wasn't until that period in the 1950s and 1960s that the U.S. began to try to develop Puerto Rico and pull it up from the underdevelopment into which we had cast it for the first half of the 20th century. STEPHEN KINZER: I place the American history regime1. change in three chronological groups. The first set of our overthrows of foreign governments came in the late 19th, early 20th century. That was the period when we could openly invade foreign countries. In the Cold War, we couldn’t do that anymore, because we were afraid there might be a counter-reaction from the Soviet Union. That's why we had to use the C.I.A. to overthrow governments covertly. But with the fading of the Soviet Union, we didn't have to do that anymore. We could go back to plan A, so to speak, which was invading governments. COUP #6 Now, the Grenada situation started when a radical clique of ultra-militants within Grenada rose up and assassinated their own political leaders. A small group of a couple of hundred of American medical students were also on Grenada. Now, the U.S. could probably have evacuated those students quite easily. In fact, the new regime was eager to be rid of them, in order not to give a pretext to the United States. But there was a larger global political context in which the Grenada operation happened. The United States was still recovering from the humiliation of the loss of Vietnam. And actually the very weekend before the Grenada invasion was launched was the weekend when the U.S. Marine barracks in Lebanon was blown up, with the loss of the lives of more than 200 Marines. The U.S. had been feeling very impotent in the world, and President Reagan had come to power with the promise that he would make America stand tall again. So the possibility of peacefully resolving the Grenada crisis, which is what some of the regional leaders wanted to do -- they wanted a blockade around Grenada, which has no natural resources, doesn’t even have water or gasoline or anything, so it would have been very susceptible to some kind of regional pressure. This did not appeal to the United States. Reagan and his aides immediately realized this as a chance for the U.S. to score a big military victory, something we hadn't had for many, many years. Now, the whole population of Grenada can fit into the Rose Bowl. 1.It’s a very, very small place. That's why, after the invasion, we had a spectacular opportunity at a very, very low price to transform Grenada into the garden spot of the Caribbean and show that something good could come after American interventions. The cost of that would have been so pitifully low -- it's 100,000 or 120,000 people -- but immediately, instead of doing that, we turned our back on Grenada, and we went on to the next project. But it did serve the purpose of the Reagan administration, which was to give America a victory, even though it was a victory over a pitifully small island, and to be able to show Marines doing something positive. That, I think, was the real reason we carried out that operation. 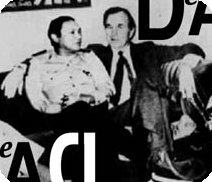 AMY GOODMAN: COUP #7 And Panama, the picture you have of President Bush, Sr., that is with Noriega,==> who’s now in a prison in the United States? STEPHEN KINZER: We intervened and invaded Panama in order to overthrow General Noriega, but what I discovered upon working on my Panama chapter is that Noriega had been on the payroll of the C.I.A. for 30 years. He committed a number of sins. Part of it was his involvement in the drug trade, although the U.S. government and the C.I.A. had been completely aware of this for years. He was leading Panama out of the U.S. orbit. He was interfering with American plans to carry out the Contra war in Central America. You'll remember the Contadora process that was part of the peace process in Central America. Contadora is actually an island in Panama, so it was there that some of this peace process that undermined the Contra project took place. In addition, Noriega could have been overthrown in a coup that Panamanians were carrying out just a few days before our invasion. And the Panamanian general who was carrying out this coup informed the U.S. -- he only asked the U.S. to block a couple of roads to prevent Noriega’s loyalists from coming into Panama. And that coup would have succeeded, but we didn't support it, and the American commander later explained why. He said that coup would have only overthrown Noriega. It would have left the very nationalist Panamanian defense force intact. We didn't only want to get rid of Noriega. We wanted to get rid of the entire military institution which had fallen away from American influence and become a reflection of some nationalist Panamanian aspirations. And that wasn’t a successful outcome of the Panamanian intervention. AMY GOODMAN: And that brings us to Iraq today. KINZER: Yes, Iraq. And the results aren't in yet. But they look terrible. Like bad karma for all the other times put together. POSTER'S NOTE: ISIS is all of Saddam Hussein's armies, reorganized. It is 'official' BLOWBACK! *Kennedy's CIA murdered the DIEM BROTHERS in VIETNAM without his OK, hoping to make the people happier as the Diems were Frenchified. They were Catholics and JFK went nuts as now HE had killed Catholics. He wrote NSC MEMO 263 to get troops out of Nam. That was 40 days before his death. * Stephen Kinzer, author of "Overthrow: America's Century of Regime Change from Hawaii to Iraq." He is a former New York Times foreign correspondent and author of several books, including "All the Shah's Men" and "Bitter Fruit." About the Deposing of Mosedegh in Iran, an elected president, and ARBENZ in Guatemala, elected and about USA retaking ANACONDA COPPER after Allende nationalized Chile's copper industry. NOTE Kinzer forgot what we did to NICARAGUA. And lately, we're destabilizing everybody the IMF has on their ROTHSCHILD HIT LIST, any country not tied to Roth banks. Libya was the big one. KHADAFI WAS A HERO in reality. To his people!